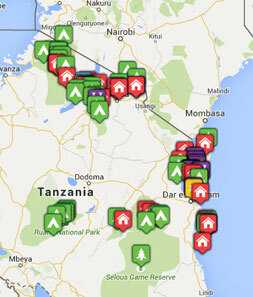 Tribes Overall: "Wonderful arrangements, great support, extremely nice and friendly people in Tanzania. " Tribes Service: "Extremely helpful, generous and supportive"
Guides: "Extremely knowledgeable, very forthcoming with information, great game spotter. " Social & Environmental Responsibility: "At the lower levels, all the people were environmentally aware. This is not true at the higher levels.."
Very big, busy lodge, when it's really hot, the swimming pool must be very appreciated. Well tended camp with amazingly luxurious tents. We felt really welcome and comfortable there. Actually we never stayed there, we stayed in the Ngorongoro Lodge, which was great! Just an excellent, lovely place with extremely helpful and friendly people. The beach is lovely, too. Too bad, that nearby at the fishing village the beach is terrible, full of plastic and debris. It's sad to see the absolute ignorance to environmental matters. That has of course nothing to do with our lovely place, it's just saddening.